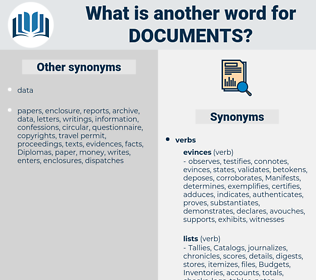 What is another word for documents? documentaries, statements, declarations, Certifications, drafts, documentations, passports, credentials, papers, note, instruments. 7, 31, 45, 8, 13, 29, 2004.
archives, Minorities, deliverables, CPDS, Crimes, Forms, holdings, affairs, procedures, actes, acts, PRSPS, DOCS, instruments. credentials, procedures, qualifications, copy, Copies, transaction, supplement, customs, folders, organization, provisions, directions, captions, ministerial, paper, guiding, Selections, c., speech, selected, actes, proactive, limited, particulars, standard, Standards, data, de, acts, council, actions, deeds, ombudsman, parts, reading, norms, agency, search, coin, Coins, outreach, rubric, financial, outputs, rooms, court, assembly, annual, broadcast, security, Securities, regional, DND, PRSPS, exemplary, chart, latin, degrees, iv, panel, human, chair, Plays, public, documento, doc, DOCS, instrument, instruments. communications, memoranda, Recommendations, requirements, comments, specifications, descriptions, outcomes, conditions, enactments, manuscripts, purposes, implements, attestations, methods, account, accounts, presents, Patents, matters, complaints, incidents, reproduced, resolutions, means, pre-encumbrances, attachments, collections, destruction, authorities, letters, article, articles, covenants, presentations, mandates, codes, denominations, conventions, Memoirs, transactions, supplements, events, guidances, Clients, writings, Descriptors, notices, invoices, preparation, customers, printouts, investigations, Governments, commissioner, parliament, Brochures, Identities, signatures, details, contributions, Pamphlets, reporting, Regulations, indicates, participants, formalities, operations, guides, words, disclosures, Measures, Indicated, Consultations, proofs, narratives, Negotiations, Investigators, statutes, indicators, findings, charter, charters, Organizations, sections, statistics, sources, structures, pollutants, performances, conservation, archives, objects, messages, weapons, relationships, points, Expenditures, discussions, topics, contracts, projects, Scriptures, departments, tools, Textbooks, contains, chapters, C, offences, Appendices, downloads, questions, names, Deposited, decisions, productions, Treaties, versions, videos, facts, tenders, citations, Schedules, published, Templates, mechanisms, sites, warrants, times, orders, specifically, moves, alternatives, relations, inputs, conclusions, Languages, proposals, Essays, instances, Entries, Instrumentalities, map, Maps, systems, sheets, Conferences, steps, confidences, results, electors, deliverables, profiles, framework, frameworks, dimensions, Registries, users, Foundations, employees, offers, bedrooms, fonds, numbers, page, PAGES, bills, receipts, manuals, liabilities, regions, issuances, terrorists, scripts, tasks, premises, can, prevention, obligations, Duties, subjects, assets, machines, vouchers, tumblers, writing, Stories, accords, Permits, months, products, books, Artefacts, technical, lists, who, FORMATS, briefs, sessions, plans, burdens, Artifacts, Countries, packages, stocks, rules, Studies, CPDS, postings, advices, voters, programmes, auditors, worksheets, Surveys, Analyses, laws, Bibliographies, samples, deadline, deadlines, ways, tokens, authority, responses, shreds, corporations, requesters, devices, things, Vehicles, Tests, Ids, ENTS, quarters, textes, SPDS, media, services, Filings, practices, Areas, Pleadings, aspects, only, dispatches, examples, Policies, headlines, chambers, newspapers, licences, inventors, Exercises, bits, Crimes, Properties, attacks, clearances, Programs, marks, people, bonds, opinions, Societies, shows, packets, Companies, papiers, Charges, quotas, ministries, loads, odds, reasons, ratios, Voices, Patches, Ones, PODS, Activities, loadings, others, nations, DPRS, reviews, additions, abstract, scores, demands, circulars, returns, castings, Assemblies, aids, civilians, types, highlights, purchases, Diplomas, charts, banks, flames, claims, DIMES, Capacities, offices, Forms, VISAS, borders, final, members, tabs, links, stalls, exchanges, interests, principals, fittings, holdings, originals, annexes, registers, Pennies, paragraph, expenses, Roles, targets, Rights, offerings, requests, blocks, duly, bids, controls, spaces, releases, deals, levels, nickels, suits, B, sets, Guns, TBS, -rsb-, titres, cars, theatre, units, _, views, supplies, -, iii, <, places, calls, date, Leaves, SPARES, 2003, meetings, Parties, 29, 2004, states, procedures, 2008, ii, shares, 1996, figures, 2001, qualifications, Copies, customs, goods, folders, organization, provisions, directions, captions, LINEs, Him, Selections, actes, particulars, Standards, data, acts, actions, deeds, parts, norms, Coins, outputs, rooms, Securities, PRSPS, degrees, Plays, DOCS. recordkeeping, affidavit, updated, warrant, toolkit, stuff, paper, doc, pamphlet. contained, Issued, published, Were, found, Appeared, Hoped, paper, papers. following, writing, dealing, Relating, Adding, meeting. 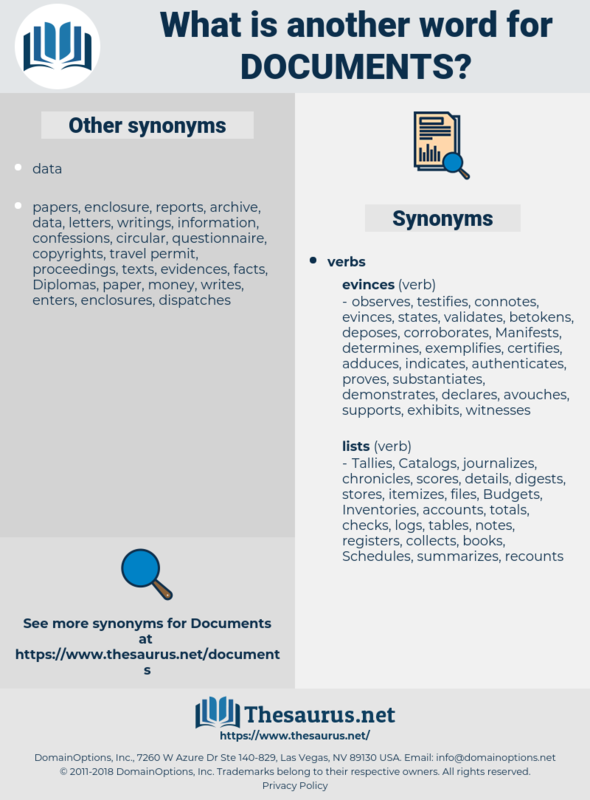 Mentioned, contained, Filed, produced, preferred, circulated, Issued, Obtained, included, developed, sent, Occurred, signed, Provided, published, found, expected, requested, held, used, received, given, kept, made, selected, papers. demonstrates, recounts, substantiates, confirms, mentions, identifies, Does, traces, Addresses, informing, illustrates, enactments, presents, concerns, attachments, rule, explains, exposes, establishes, reflects, underpins, Regulations, indicates, support, supports, justified, justifies, possesses, covers, provides, reveals, contains, tells, vouchers, ENTS, shows, makes, Leaves, paper, acts, Plays, papers, DOCS. Can't I put those documents away under your directions? Before he left the bedroom, he paused a moment at the desk, the documents of the Bellward case in his hands. Dika Nut, detachment, dissent, deckhand, documented, dismayed, designate, desiccant, descant, dockhand, discommode, dachshund, Djanet, disjointed, descent, disjoint, dignity, descend, Deoxygenate, desmid, dissonant, disjoined, Desmond Tutu, disunity, dissonate, desquamate, doughnut, dismount, designed, decant, dehiscent, dig into, disowned, discount, disunite, Docent, disseminate, decent, disownment, duty assignment, discussant, designated, discant, decimate, disunited.